Standard Vivarium 30 x 18 x 18 Inches. Dimensions of Cabinet: 30 x 18 x 26 Inches. 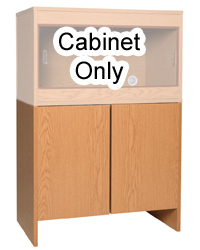 This cabinet does not come with a solid top. It has been designed to fit a vivarium that is the same size or larger. Standard Vivarium is available separately.